Nintendo is re-releasing some of its arcade games—for the first time ever since they appeared in pizza places and laundromats of the 1980s—on Nintendo Switch, beginning with Mario Bros. this month. 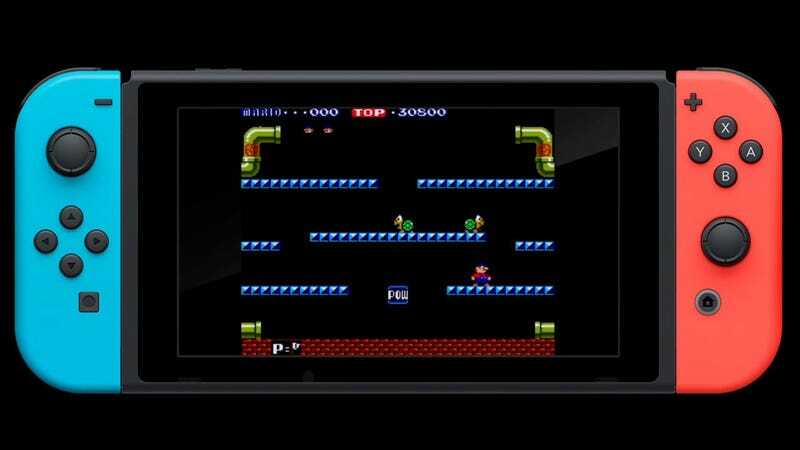 You might be surprised to hear that Nintendo, a company that re-releases many of its classic games on a regular basis, has never taken the opportunity to port its arcade software. Nintendo even introduced Virtual Console Arcade to Wii back in 2009, featuring games from other classic publishers—but never its own library. Well, for whatever reason, arcade games are back. And they fall into two major categories: the arcade originals that Nintendo made in the early 1980s, and games from the VS. System, which was a modular arcade system based on the Nintendo Entertainment System hardware. Games for VS. System were based on NES games, but with upgrades or alterations. Kickoff game Mario Bros., coming September 27, isn’t that different from the NES port that’s been re-released many times over, but it’s as we get further down the list that the differences grow. VS. Super Mario Bros, released a year after the home game, starts out similar but has a lot of power-ups and 1-up mushrooms removed or their positions swapped, and eventually simply starts using the very difficult levels from Super Mario Bros. 2, aka The Lost Levels, instead. VS. Balloon Fight’s levels are actually two screens tall, and scroll up and down. In two-player mode, each player can see a different part of the screen. Nintendo didn’t have that deep of an arcade catalog, switching over to primarily home games after the success of NES. So besides stuff like Donkey Kong (the original arcade version of which may not ever come out again due to legal entanglements) and the arcade Super Punch-Out! !, there’s not a whole lot more to look forward to for this service. Meanwhile, this edition of Nintendo Direct was mum on Nintendo’s plans for its console games, which are currently only slated to be playable on Switch via the Nintendo Online subscription service launching in 2018. For now, getting the chance to play (legally, that is) some long-neglected classics is a good stopgap.